We all know that bows and crossbows persist today, even though mostly for sports and hunting. During the Battle of Agincourt, English longbows beat French crossbows completely (note: these were NOT repeating crossbows). The one disadvantage of Chinese crossbow was they were not particularly powerful. What are the advantages of contemporary bows and crossbows? Are there still any advantages of them over firearms? Should bows and crossbows be treated similar to firearms? ^All three crossbow pictures are adjusted so that their dimensions are correctly proportional to each other. The Ming crossbow might be small, but its short stock length meant you can shoot without having your line of vision to target becoming obstructed by your crossbow stock when you are making an arched shot. Note that the typical Han crossbow have draw weight of 387 lbs, and the above 61 lb replica is already shooting at 65.5 joules. 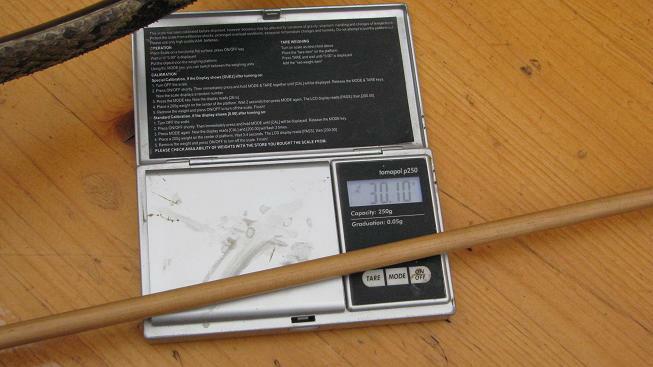 Todd's replica of a medieval steel crossbow of 450 lbs draw weight reached 54 joules in comparison, as shown in the video above. 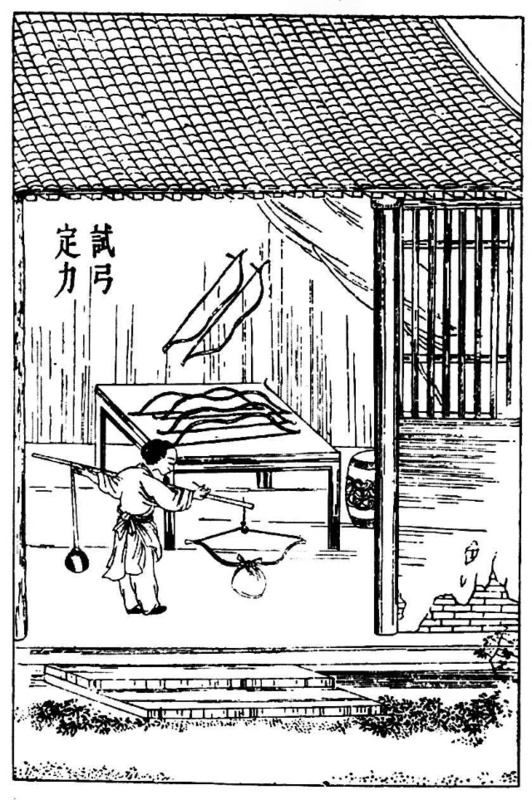 So a 61 lb ancient Chinese style crossbow would probably have equivalent power to a medieval steel crossbow of 500 lbs or more. One of the main reasons for this is due to the very long powerstroke. 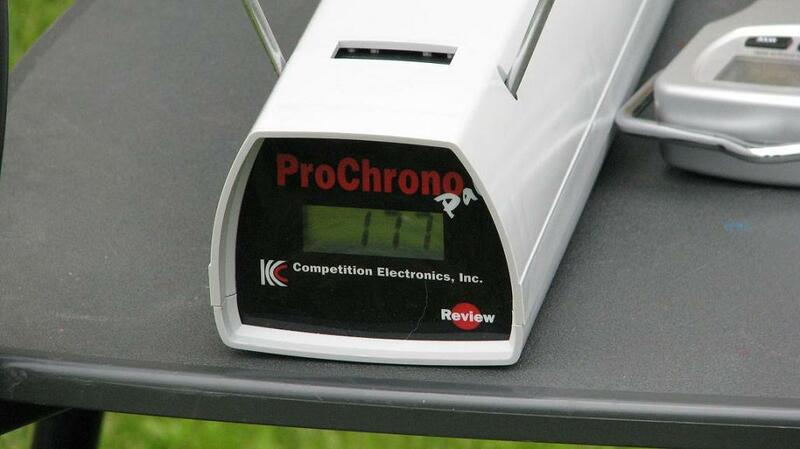 ^I should mention that the crossbow which shot 260 meters had decreased in draw weight to 4.42 dan when it was shot. Translation: Number one 6 stone crossbow, fully assembled, present strength is 4 stone 42 chin (285 lbs), and it will shoot to the end of 185 paces (259 meters). So 1 stone = 120 jin = 30,000 grams = 66.14 lbs. My measure of 64.5 lbs is actually slightly lighter than that. The most widely used crossbow of 6 dan means ~387 lbs. Within the stock's teeth it is 1 chi 8 cun (22.7 inches), the gourd head is 4 cun (5.4 inches). The stirrup is 2 chi (25.2 inches). The stock have length 2 chi 3 cun (29 inches), the horn prod have length 4 chi 5 cun (56.7 inches). 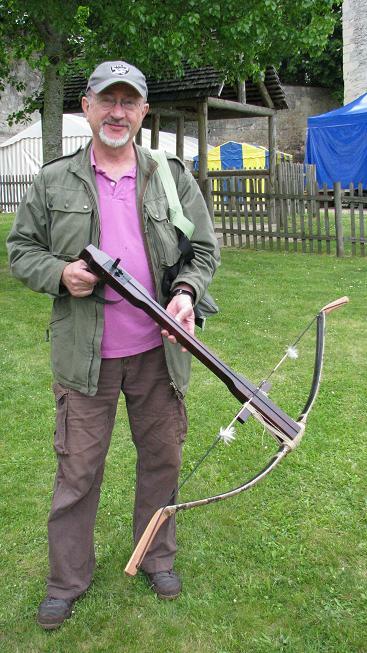 When Andreas Bichler made a 1270 lb crossbow with 14.76 inch powerstroke (a far longer powerstroke than typical Medieval European crossbows), it was too big to be handheld. So I would regard it more as field artillery. You can compare it with his 1200 lb crossbow with a much shorter powerstroke (and hence small enough to be handheld). Crecy, not Agincourt. The only reason why Genoese crossbows were outranged was because they got wet in the rain. The English carried their bowstrings under their hats to keep them dry. Modern advantage of bows and crossbows over firearms - stealth. Bows and crosssbows are still quieter than firearms. In some jurisdictions bows and crossbows might be less regulated than firearms. If one believes that governments should not regulate non-existant problems, then bows and crossbows should not be regulated. If mass murderers start using crossbows, then we'll have to re-examine the regulatory question. I always wanted to know if infantry armed with bows and arrows in line infantry fashion could defeat infantry armed with muskets. The only way this could happen is if there was a heavy rainstorm and the gunpowder was too wet to ignite. I disagree. If the English (or whoever) had managed to keep a secret stash of trained archers into the post armor musket era, then rate of fire, range advantage, and the fact that wool coats are no impediment to sharpened arrowheads (as opposed to bodkins which would have problems), I think a group of archers could destroy a musket formation. The problem comes from paying to keep all the useless archers around for a century on the off chance hope that armor will go away, which at the time probably didn't seem very likely. Also it would only work for a limited time before armor came right back. Although the last major battle of the Hundred Years War, the Battle of Castillon in 1453, when English longbowmen were ripped to pieces by French artillery is considered the demise of teh weapon, the Longbow continued to be used right through the Wars of the Roses against hand-cannon, notably at Towton and against Arquebus's at Flodden. It was still a standard weapon for yeoman into Elizabethan times and all but two examples still existing of original longbows were recovered from the Wreck of Henry VIII's "Mary Rose"
As a skilled bowman could range a shot at 200-300 yds or more and loose six or seven flights in the time it took to reload a musket with inferior range, was much lighter and never mis-fired, one wonders why it died out so quickly. The answer is usually put forward that it took a lifetime of weekly practice to create an archer who was any use on the battlefield--boys starting as young as seven and graduating to a full-size longbow by twelve. A serious bowman could command a high wage. On the other hand a "musketeer" could be trained in a few days and was both cheap and expendable. Could ANYTHING have been done to prevent the Bolshevik seizure of power in 1917?